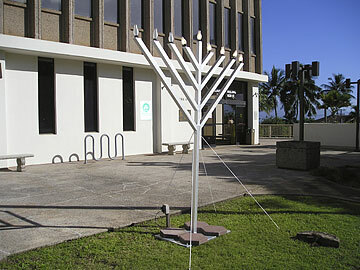 Maui Mayor Alan Arakawa agreed to allow a group to install a Jewish menorah in front of the County Building in Wailuku, in celebration of Hanukkah. In response to complaints from the American Civil Liberties Union earlier this week, Arakawa's administration said other religious displays were welcomed as well. WAILUKU » County workers were installing a Christmas tree next to a Hanukkah display in front of the Maui County Building yesterday, after the American Civil Liberties Union raised concerns about stand-alone Jewish religious symbols on county property. ACLU legal director Lois Perrin said the issue has been resolved and that county officials will allow other religious groups the opportunity to erect exhibits near the Jewish display. Perrin said on Monday that ACLU members noticed that the front of the County Building had on display a Jewish menorah, a candelabrum with nine candles celebrating Hanukkah, and a dreidel, a spinning toy top used in a game played by children during Hanukkah. Perrin sent a letter to Mayor Alan Arakawa on Monday, noting that the prominent stand-alone display gave the impression that the county was endorsing the Jewish religion. Perrin said so long as other religious groups are allowed to establish a display in the courtyard, her group had no objection. The goal of the ACLU is not to ruin the celebration of Hanukkah, but to make sure the government does not endorse the view of one religion to the exclusion of others, she said. Based on a Supreme Court decision in 1989, the stand-alone display of the menorah appeared to be unconstitutional, Perrin said. But the Supreme Court has ruled that having a menorah next to a Christmas tree is allowable under the Constitution because it indicates the celebration display is secular. First Deputy Corporation Counsel Traci Villarosa said a group asked Arakawa if it was OK to put up a Hanukkah display in front of the County Building, and Arakawa agreed. Villarosa said while Arakawa would have permitted other organizations to put up holiday exhibits, the group with the Hanukkah display was the only one that approached him this holiday season. "It was always the case that the mayor would permit organizations to put up holiday displays," she said.